Research and development of Fiber-Reinforced Polymers (FRP) has been ongoing since the 1930s, when glass strands were combined with plastics or other polymers to create a lightweight, reinforced composite known commonly as fiberglass. It was of immediate interest in the field of aviation, but the real-world applications of fiberglass have broadened and are continuing to expand as advancements of, and innovations into FRP technology progress. Strongwell is dedicated to continued FRP innovations, with increasing industry awareness of the practical applications of fiberglass establishing it as a convenient alternative to traditional materials. With increased corrosion resistance, significantly low maintenance costs and requirements, and shorter installation periods, fiberglass is now a popular and commonly utilized construction material worldwide. Rooftop communication antennas are often shielded from view to improve the visual impact of buildings and to avoid weather-related damage to cellular equipment. Screening materials for the cellular industry needs to be robust and stable, but most importantly; they must not interfere with cellular emissions or radio frequencies. Strongwell’s FRP is the perfect solution to this problem because of its high radio frequency transparency, meaning that cellular signals can easily pass through FRP screenings. You will typically notice fiberglass cellular screenings on rooftops in urban environments. 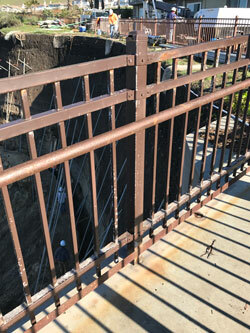 Fiberglass handrails, fences, and gates offer unique benefits over traditional materials as they are able to withstand various elemental corrosives, including salt water and acid rain. FRP comes in a range of colors and can be uniquely shaped to create attractive custom designs which are both robust and aesthetically suited to their commercial, industrial, or residential environments. As such, you will commonly see FRP handrail and fencing structures applied at both seaside and freshwater venues, from docks to seawalls. Due to their low-conductive properties, FRP ladders have been extensively implemented for use in the electrical utilities industry, but their cost-efficiency and wide-range of safety benefits have resulted in a growing market share of industrial ladders in various sectors. This shift has also been reflected in the increasing popularity of fiberglass ladders for residential use, where traditional wood and metal ladders are gradually being replaced by durable and resistant FRP alternatives. FRP is not only lightweight and durable, it also features a high impact resistance. This is an ideal combination to produce cost-efficient, purpose-built tools. Specific stress points can be individually reinforced to ensure that FRP-enhanced tools remain strong and fit for purpose for an extensive period. The sturdiness and versatility of FRP, combined with its comprehensive corrosion resistance, makes it the ideal material for use in waterpark structures such as water slides and flumes. The demands on these structures are manifold, as they must meet stringent safety measures to ensure the security and wellbeing of parkgoers, while also providing an entertainment factor, and resisting the daily corrosive and rotting potential associated with water flow and chlorine. FRP is uniquely suited to handle each of these demands in tandem, with minimal daily maintenance required and a variety of colors available to suit any thematic elements. Strongwell are committed to solving structural problems by developing and implementing high quality fiberglass in sectors and locations across the world. Our fiberglass is high strength and light weight, combining electromagnetic transparency with low conductivity to ensure a wide range of current and potential future applications. If you require any more information about our FRP products, do not hesitate to contact us.